The original design intention is not to advertise routes using ospf over NBMA network, it is not necessary for this case. However for Buona Vista HQ to be able to reach the two sites, I need entries in the routing table to let other routers know the road map to reach. A way is to let OSPF advertise a default route by using default-information originate always command, this diagram is very straightforward as there’s only one exit point out. 1. If 2651-3 (advertising router) has a default route, advertise the default route within ospf process using default-information originate command. 2. The alternative way is to advertise default route irregardless whether 2651-3 (advertising router) has the default route or not this is accomplished by including the keyword always at the end of default-information originate command. The default metric type is E2 which is not incremental. If a destination ip subnet is unknown by 1841-1, it will send it to 2651-3. 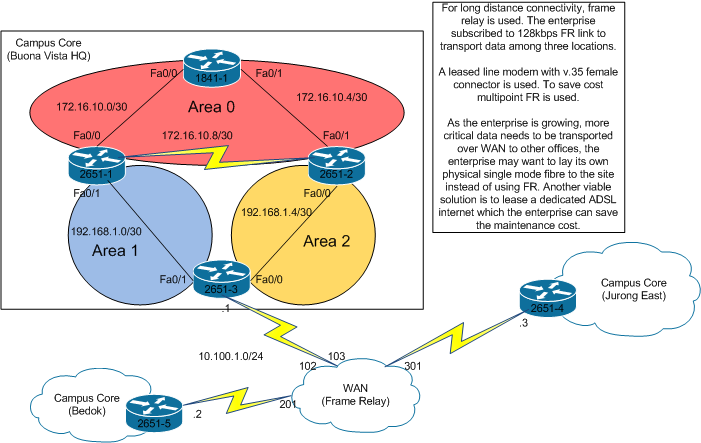 This entry was posted in Frame-relay, OSPF, Route, WAN and tagged frame-relay, nbma, ospf. Bookmark the permalink.